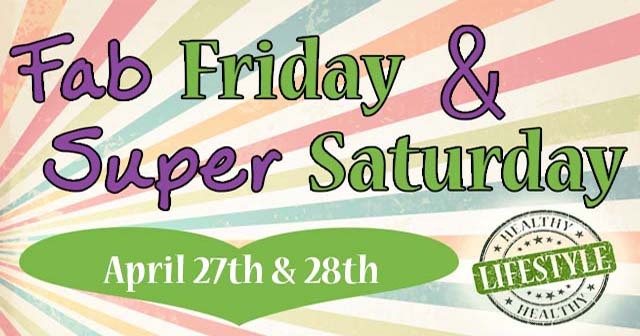 It’s almost time for our first Fab Friday and Super Saturday weekend of the year here at Evolv! Friday April 27th and Saturday April 28th are the dates to remember. We’ll have our usual great range of special offers on products, treatments, and therapies. There’ll also be free consultations and expert advice on some of our newer products. €10 all-natural Holos facials, with company owner Niamh – Call (053) 923 6009 to book. Dr Hauschka special facials, with resident Dr Hauschka skincare expert Josephine – Just €40 for one hour – Call (053) 923 6009 to book. Iridology – Just €25 for a 30-minute consultation – Call (053) 923 6009 to book. €20 ‘Mega Test’ for yeast infection, digestive enzymes, worms, dairy, grains, sugars, and vitamins & minerals deficiency – Call (053) 923 6009 to book. Omega 3 Fish Oil – Buy one, get a second half price. Up to 50% off all items in our gifts range. Free consultations and special offer on ‘Revive’ – an amino acid, vitamin and mineral complex combining 26 amazing active ingredients in one daily sachet, to help you look, feel, and perform at your best. €10 Dr Haushcka facials with Josephine – Call (053) 923 6009 to book. Reiki – Just €25 for a 30-minute session – Call (053) 923 6009 to book. Hypnotherapy with Michael White – Just €45 for a one-hour session – Call (053) 923 6009 to book. Tarot Readings – Just €25 for a 40-minute reading – Call (053) 923 6009 to book. Kinesiology – Just €25 for a 40-minute treatment – Call (053) 923 6009 to book. Two-for-one Allergy Test & Nutritional Consultation – Just €50 – Call (053) 923 6009 to book. Saturday will also be an Information Day for Love Hemp CBD Oil – You ask, we answer! You can see we’ve lots on offer on Fab Friday April 27th and Super Saturday April 28th – so don’t miss out. We look forward to seeing you!